With the growing awareness and support behind aquaponics gardening, more people are trying to introduce it in their day to day lives. In many places there are laws in place to keep them from growing certain species of fish, in many cases Tilapia or different types of Tilapia. Although the laws are generally in place by local fish and wildlife departments, they do not often take into effect the home farmer. 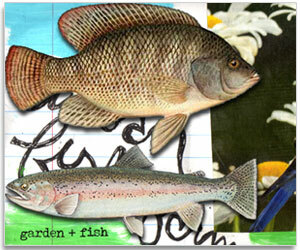 In New Mexico a restaurant owner is trying to get a bill passed so that he would be allowed to grow his own Tilapia. Many of us want to eat in a healthy way, but often times, the cost is a deterrent. Now there’s a push in the legislature to pass a bill that would allow New Mexicans to farm their own fish and vegetables inside their homes. It’s using a fairly new method of farming called “Aquaponics” – a sustainable way to farm fish and vegetables simultaneously. Chris Morales, co-owner of Golden Crown Panaderia near Old Town, has been using Aquaponics to grow basil since the fall of 2013. “[It’s] absolutely worth it. The amount of basil we’re able to grow out of this system, we’re saving thousands of dollars of year,” said Chris Morales. The system is multifaceted. On the bottom is his fish tank filled with goldfish, and on top is his soilless garden. “The water will become nutrient rich from the waste from the fish,” said Morales. He said it’s a way for him to grow practically anything quicker and year round. Morales said his restaurant is the first in the country to have an Aquaponics garden inside the restaurant. But there’s one problem: he can’t eat the goldfish. If he could use tilapia in his fish tank, he said his business would be even more profitable. People like Chris Morales are the reason why Michael McNair is pushing for changes In the law. He’s president of the New Mexico Aquaponics Association, Inc. and is pushing for HB 201 to be passed. It would add tilapia and striped sea bass to the list of fish New Mexico Game and Fish regulate. That way, people could use Aquaponics to farm fish. “The farm fish sales in other states are going through the roof. It’s an industry that’s just going off the charts. In Arizona, they’re selling over $6 million in farmed fish,” said Michael McNair.